Can the Saffron Establishment ever wash its hands of the growing menace? Cow vigilantism which has received tremendous boost since the ascendance of BJP at the centre got its first fitting reply in Gujarat recently. The way in which a self-proclaimed GauRakshak Dal – owing allegiance to Shiv Sena – attacked a group of Dalits in Una (11 th July 2016) who were skinning a dead cow, publicly flogged them, led them to the police station charging them with cow slaughter and even circulated a video of the whole incident on social media to spread further terror, has caused tremendous uproar. Thousands and thousands of Dalits have come out on streets in different parts of the state, gheraoed government offices, damaged government property, enforced state-widebandh and tried to bring the government to its knees, demanding severe punishment to the guilty and strict action against the police and government officials who failed to act upon their complaint when they were being publicly brutalised. The wave of protests has still not ebbed. The anger still simmers. Protest rallies still continue. There have been thirty incidents of suicide attempts by Dalit youth protesting the Una incident within a span of just one week. People across political spectrum are appealing to the angry youth not to resort to this extreme step and continue with peaceful struggle. Undoubtedly, Una incident and the consequent dalit assertion is proving to be a great turning point in the history of the dalit movement as Dalits have ultimately realised that politics of Hindutva is no friend of dalits and in fact, it is geared towards strengthening and further consolidating the purity and pollution based caste system.The growing disenchantment of Dalits with the politics of Hindutva was very much evident when their protests reached NarendraModi’s home town of Vadnagar itself where thousands of dalits participated in a militant demonstration blaming the Prime Minister himself and BJP for the brutal thrashing of Dalits. Videos of the protest showed many Dalit people shouting, “Hai re Modi…hai-hai re Modi,” – modification of a slogan used by women during Hindu funeral processions.(http://www.hindustantimes.com/india-news/dalits-protest-una-thrashing-in-modi-s-hometown-blame-bjp-and-hindutva/story-PcDEifwFGlHn20fLwuvTOJ.html). The outrage has rekindled memories of the militant assertion in early eighties led by the earlier generation of young dalits wherein they had fought to defend policy of reservation and also dared to take on the Hindutva formations head-on. Fact finding reports which have appeared in sections of the media tell how the police did not stop the perpetrators on their way and also took hours to lodge a simple FIR and arrest the criminals. There are even unconfirmed reports that local police had even tipped the GauRakshak Dal about the skinning of the dead cow. The complicity and connivance of the local police is evident also in the fact that despite enough proof available with it in the form of the video of the incident about involvement of more than thirty people in the thrashing incident, it has kept number of arrests limited at eight only and is trying to portray it as an one off incident. ‘These vigilantes are self-proclaimed gaurakshaks but in actual fact they are hooligans’. According to him there are as many as 200 cow vigilante groups in the Gujarat who have ‘become a law and order problem because of their aggression and the way they take law into their hands’ and government is going to take strong action against them. The Chief Secretary was even categorical in admitting that lower level police personnel are hand in glove with these vigilantes. (http://www.thehindu.com/news/national/other-states/vigilantes-are-the-new-security-threat/article8882354.ece). Dalit anger witnessed on the streets of Gujarat – variously described as Dalit rebellion by a section of the commentators – has had spiralling effect in other parts of the country as well, and has also helped galvanise the entire parliamentary opposition camp which has even demanded that there should be immediate ban on all such GauRakshakDalsand all such miscreants who operate under its name and engage in mayhem. Members of parliament on the floor of the house have denounced all these vigilante groups who are targeting Muslims as well as Dalits, brutalising them in very many ways and on occasions lynching them and explained how the policies and programmes of the powers that be has made a conducive atmosphere for their proliferation and demanded ban on them. The manner in which cow is being moved at the centre stage of politics and where mere a rumour that it is being slaughtered somewhere gives miscreants a licence to take law into their own hands with due connivance of the police and administration, is being compared with neighbouring Pakistan where the ‘crime of blasphemy’ serves similar purpose. Pakistan has lost many precious lives and many more are rotting in jail due to its refusal to check religious fanatics for whom the blasphemy laws have become a tool to intimidate innocents. Concerns are being raised whether India would similarly go ‘Pakistan’ way – unable to stop erosion of secular principles in polity and facilitating further legitimacy to faith in social-political lives. While the BJP and RSS having lost battle of perceptions are busy counting losses in the aftermath of the Una incident, and assessing its electoral fallout, the misogynistic remarks by a senior leader of the BJP targeting Ms Mayawati, leader of BSP and who has been Chief Minister of UP, has added further fuel to the fire. It is a different matter that all their ‘regrets’ about these remarks expressed on the floor of the house have proved to be an eyewash and at ground level they are trying to be on the offensive again utilising similar condemnable remarks allegedly made by fellow politican of the BSP. 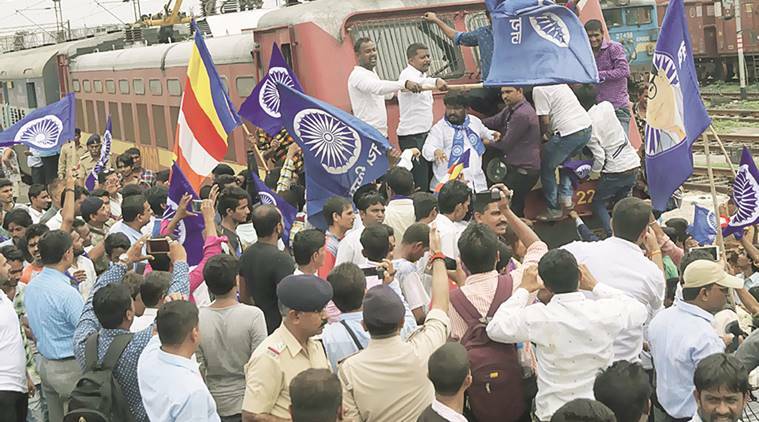 Coming close on the heels of demolition of AmbedkarBhavan, in neighbouring Maharashtra by a BJP led government – a decision which it regrets now because of spurt in voices of opposition to this act – and the nationwide mass movement which emerged after the ‘institutional murder’ of scholar RohithVemula of Hyderabad Central University, and the alleged role of few central ministers in letting it happen and a series of anti-Dalit actions and controversial statements by its top leaders targeting the community, or their attempts to discontinue the policy of affirmative action for Dalits and Adivasis, the unfolding Dalit anger has also seriously dented their well-planned strategy of consolidating their base among the Dalits at an all India level. Undoubtedly Dalit outrage has not only put the saffron dispensation at the state as well as centre on the defensive and has put paid to their well calibrated strategy of appropriating Ambedkar by projecting him as a ‘Hindu Social Reformer’. Whatever might their claims vis-a-vis Hindu Unity, this incident – which was no exception and was part of a unfolding pattern of denying basic human rights to Dalits, intimidating them and using them as stormtroppers for their anti-minority actions – has laid bare the essentially Manuvadi/Brahminical core of their ideology based on exclusion and hate. In fact their worldview is basically anti-thetical to any vision of dalit empowerment/emancipation or for that matter inclusive development. And it has further demonstrated that their feverish attempts notwithstanding to aggravate tensions between dalits and muslims at grassroot level on flimsy pretext, in their worldview of Hindu Rashtra both of them are equally dispensable. The unprecedented fury shown by the Dalit masses in a state, which has been ruled by the Hindutva forces for more than 15 years, and was projected by them as a unique ‘Gujarat Model’ of development prior to the elections to the Parliament in 2014, has shaken them to the core and has left them scrambling for solutions. They are slowly realising that the assertion of the Dalit masses has the potential of disrupting all their political calculations in the coming elections to different state assemblies – Punjab, UP and Gujarat itself – which are scheduled to be held in 2017. It need be underlined here that the depredations of the cow vigilante groups are not limited to Dalitsalone, in fact, Muslims have been their chief targets – as a cursory perusal of events since last two years makes it obvious. The latest in the series happened to be from Gurgaon where two Muslim transporters were attacked by a GauRakshakgroup and were fed with cow dung laced with urine since they were found to be carrying cattles. A video of the said incident had also gone viral.A leader of the group even claimed on camera that they have done it to ‘purify’ them of their sins. (http://www.dnaindia.com/india/report-gau-raksha-dal-force-fed-beef-smugglers-cow-dung-and-make-them-drink-cow-urine-2229190) And since Haryana happens to be a BJP ruled state – which is also contemplating forming ‘Cow Protection Force’ much on the lines of Home Guards and has also appointed a special officer of the IAS rank to curb ‘cow smuggling’ there was no action against the perpetrators. It was only last year that Palwal in Haryana witnessed communal riot like situation. The immediate trigger for the situation was the cow vigilantes themselves who had attacked a truck carrying meat and had spread a rumour that it was carrying beef. Police reached there within no time and instead of taking action against the perpetrators charged the driver and owner of the truck with criminal conspiracy and sent them to jail. The very next day government announced that all cases filed earlier against ‘cow protectors’ would be withdrawn immediately making it obvious that how it would have no qualms if similar actions occur in future. End of December last year, village Banokhedi, district Karnal ( Haryana) witnessed indiscriminate firing by a cow vigilante group on a canter (mini-truck) which was carrying people – most of them belonging to minority community – who were travelling from Punjab to UP for the coming Panchayat elections. (Refer :Lok Lahar, 14 Dec 2015) It led to death of one youth and serious injuries to several others. Cow vigilantes attacked the truck in middle of the night and what was more worrisome that there were few policemen also with them. Later five people were arrested among them there were two policemen as well. The menace of cow vigilante groups is not limited to one particular area or state, it has spread all over the country. Few months back cow vigilantes had lynched two youths belonging to minority community ( one of them a minor) near Latehar, Jharkhand and left them hanging on tree, as they were also found carrying cattles and the cow protectors wanted to ‘teach them a lesson’. Sarahan village, District Nahan( Himachal Pradesh) was witness to an attack on a group of minority youth by cow vigilantes (Oct 2015) which led to death of one them and four others were seriously wounded. Cow vigilantes alleged that the youth were engaged in cow smuggling. Last year similar group attacked a Kashmir bound truck with petrol bomb which led to the death of a young man Zahid (19 years) because of serious burn injuries. It was only few months back that Mehbooba Mufti, Chief Minister of Jammu and Kashmir wrote to Chief Minister of Punjab how people from Kashmir who are meat exporters and traders are being regularly brutalised in the state by self-proclaimedGauBhakts. (http://timesofindia.indiatimes.com/city/chandigarh/Cow-vigilante-groups-bent-on-circumventing-law-HC/articleshow/52197819.cms). It is futile to imagine that BJP – an affiliate of the RashtriyaSwayamsevakSangh -would rein in Cow Vigilantes, just because Dalits are feeling outraged over some incidents involving them or sections of judiciary or even executive are appalled at their transgressing of Constitutional values and principles or the peace and justice loving people of the country are reminding the Pracharak turned PM that he had declared in the august house of the Parliament that for him ‘Constitution is the most sacred book now. We should never forget that the SanghParivar, operates through its vast network of what are known as anushangik( affiliated) organisations – with a strict division of labour between them – to further the agenda of Hindu Rashtra. In fact, it would leave no stone unturned to deflect attention of the people from its essentially Varnamindset which refuses to even acknowledge that assertion of Dalits has basis in the age old hierarchy based system. They would be ready to go to any extent to silence all such voices which are questioning them, challenging them and are in a position to put roadblocks on their ‘path to victory’. An inkling of what is in store for all such voices can be had from the unprovoked attack on a public meeting protesting Dalit atrocities in Gujarat organised by a Dalit group in the heart of the capital itself by an organisation which is alleged to be close to the Hindutva Brigade. (http://indianexpress.com/article/cities/delhi/protesters-clash-at-jantar-mantar/; https://tahlkanews.com/singh-sena-attack-on-dalit-at-jantar-mantar/97975). Ongoing attacks on Dalits in the ‘model state of Gujarat’ or an overall spurt in atrocities against Dalits presents before all those Dalit leaders a pertinent question who had joined the Modi bandwagon before his ascent to power and in a way helped sanitise his controversial role in the Gujarat carnage (2002 )when he happened to be Chief Minister. Whether the likes of Athavales, UditRajs and Paswans would still cling to aprons of power, further facilitating whitewashing of this essentially anti-Dalit and anti-oppressed regime or would listen to the clarion call given by the Dalits on the streets of Gujarat that without fighting RSS and Modi led BJP, dalit emancipation cannot even be imagined. The unfolding Dalit outrage also poses important question before the Dalit movement itself. Whether anger witnessed would just peter away or would be able to reinvigorate the radical agenda of Ambedkarite politics centering on caste annihilation and fighting capitalism and would present a systemic challenge before the Manuvadi-Hindutva forces forging alliances with like-minded forces. Parties like BSP have lot many things to answer on this issue. No doubt, unfolding cow vigilantism and continued silence maintained by the net-savvy PM over attacks on Dalits and minorities has further exposed the real agenda of this government. Analysts are predicting that the ruling dispensation will have to pay heavily because of its essentially anti-Dalit worldview in coming elections to state assemblies. What is still unclear that how all such forces, formations who are opposed to the agenda of Hindutva and are keen to defend secularism in the country and further democracy to the grassroots level, are strategising so that the exclucivist agenda of Hindutva is delivered a crushing defeat not only at the electoral level but at the social level also and what role a reinvigorated left is ready to play in the unfolding situation. It remains to be seen whether there would be parallel realignment of various social – political forces at the ground level comprehending the menace the very politics of Hindutva presents before the country. The present moment in the country’s history is pregnant with tremendous possibilities and demands a creative, energetic and strategic intervention from the revolutionary left. Brahminical forces are perpetrating caste discrimination by forming cow protection groups. Cow has become a political tool in the hands of upper castes to vent their jealousy on rising assertion of Muslims and dalits. They are trying to suppress transfer of power from their hands to OBC / SC/ ST / Muslims and minorities. This is the time for uniting forces against these fascists and Hindu fundamentalists. Some leaders are still clinging to power while their brothers and sisters are being tortured and bearpten – up by brahminical goons. These politicians should realise that people will not condone their behaviour when opportune time comes. Hence, all the forces opposing such brutality should unite alienating the fascist BJP and its Sangh parivar.